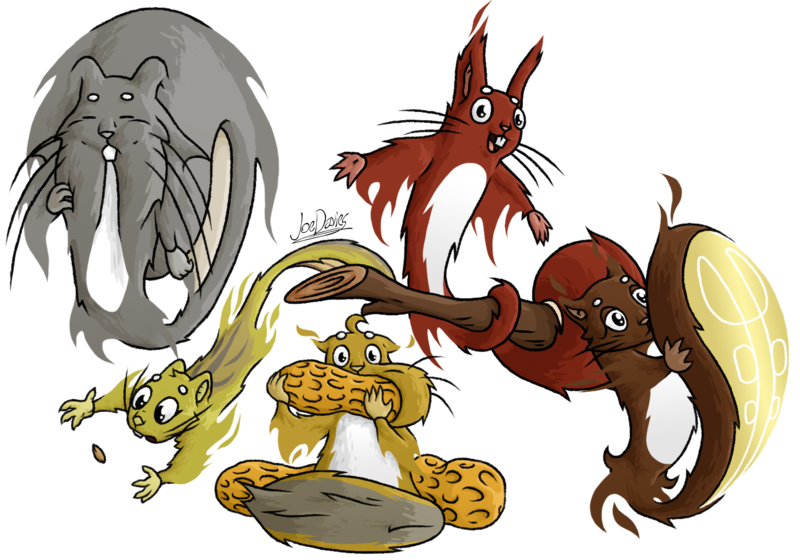 The Squites are a young race of ghostly critters that can be considered a mixture of wisps and squirrels. Yet they have the same mannerisms and personalities as humans, and are also in tune with everyday culture than any other race. Regular squirrels do not exist in Yanside for reasons that will yet to be divulged. In the meantime, Squites exist not just as cute little rodents, but also for a very significant purpose. That purpose is to care for and nurture the trees and forests in Yanside and prevent them from dying. Because Yanside is always set in a purgatorial dawn stage, most of the plants and trees of the world don’t get enough light to photosynthesise. This is where Squites come in. They have a uniquely felt surface on the underside of their tails that can glow with a powerful light. This light is used to replenish a plant’s roots with light energy that is a bit less than equal to the energy given from the sun. To use it, a Squite simply uncurls their tail and puts it in front of them, holding it like it’s another Squite and aiming the light’s rays at the roots. Not only that, but Squites also provide extra care for trees and Tremen by watering them with buckets of water, and clearing out any pest infestation by eating the parasitic grubs and fungi. These deeds have garnered them a close relationship with the Tremen, as the Tremen offer to be their houses in exchange for the resident Squite to take care of the home and any trees near it. Thus, Squites are very often found in forests. But it is also possible to find them in areas that are full of plantlife like flower fields, and areas with no plantlife like caves and mountains to grow more forests and plantlife to continue the planet’s life cycle. Thus is their duty. The Squites are apparently a very young race that were created after a climactic incident that changed the world forever. They were made to maintain plant conditions in the world after this climactic change, and were also promised something in return for this by the beings that made them. What it is they prefer not to divulge anymore because they were told that Yanside’s current purgatorial state was only temporary, but it seems that that was not the case. So they live their lives, continuing to provide service to the trees and Tremen and have accustomed themselves to everyday routine. Squites are uniquely shaped in that they look like squirrels, but they have no legs, instead having their torsos curve into a tail. But they can still move around by floating, like ghosts. Hence the ethereal vapour on their arms, lower bodies and ears, where their fur melds into a ghostly-like trail of mist. This allows them to float, but not fly. As they can lift themselves off the ground and levitate to a fair height, but only by so far. They can glide incredibly easily as well, so they can move from treetop to treetop very quickly by climbing to the top of the tree and gliding to the next one. Their string-like bodies combined with their floatation allow them to climb really easily. They can curve around tree trunks and coil around branches, similar to a serpent or a snake, but more like a spectre or a ghost. But with the added benefit of floatation, they can do all this upside-down if they wanted! Despite them being short in stature, when they float around, it looks like they can stretch, making them look even longer than they are naturally. Squites look and behave like normal squirrels. They can come in any kind of variety of fur colour and pattern that squirrels are in, and absolutely enjoy nuts and berries. But with the added benefit of personification, not only are they always diligent in their duty, but they are well aware of cultural change among the other races, and even adopt them as their own. Some Squites like to wear accessories and clothing in an effort to look stylish, some like to play new games that have been invented, and some like to learn cooking recipes so that they can find new ways to enjoy nuts and berries! How can they understand cultural change so quickly when most of them live in forests you might be asking? Well, as described in The Tremen post, the Tremen have an underground root network called the “Untrenet” where they can share any information they see along their roots to any other Tremen in the world. Since Squites live around Tremen most of their lives, they are in tune with popular culture and global incidents by talking with Tremen and discussing topics they want to research. So the Squites also double as librarians and translators, as they can tell Humans, Wolkhar and any other race what a Tremen is saying, be it from a different language, or in short versions so that the people listening don’t fall asleep. To put this in modern perspective, think of the Tremen as the computers of Yanside; huge banks of data and information, and the Squites as the technicians; who surf the web for that information to stay relevant, and also fix and maintain the Tremen to keep them working.